HAWAII ISLAND - Wil Okabe signs the county proclamation as the acting mayor. Governor David Ige followed by signing his own proclamation. (BIVN) – The mayor of Hawai‘i County, as well as the governor of the State of Hawai‘i, have signed emergency proclamations due to the new volcanic eruption that began in Leilani Estates subdivision. The county proclamation was signed by Acting Mayor Wil Okabe. Here is the text of the statement, also found here. WHEREAS, due to the possibility of imminent disaster due to property damage and/or bodily injury to residents of Hawai’i Island, and the need for government agencies and representatives from the private sector to mobilize and provide immediate services to our island residents, a state of emergency is authorized pursuant to Chapter 127A Hawai‘i Revised Statutes, and Chapter 7, Hawaii County Code. NOW, THEREFORE, I, Wil Okabe as Acting Mayor of the County of Hawai‘i, do hereby proclaim and declare that a state of emergency exists due threat of imminent disaster on the Hawaii Island, effective 4 p.m., May 3rd, and continuing thereon for 60 days or until further act by this office. 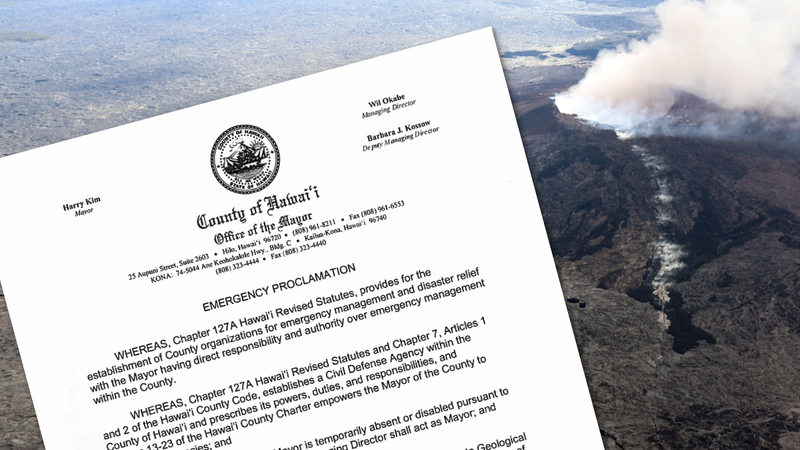 Governor David Ige followed with the signing of an emergency proclamation Thursday evening. The danger is of such magnitude that it warrants preemptive and protective action in order to provide for the safety, health and welfare of the residents of Leilani Estates and surrounding areas. This proclamation authorizes the expenditure of state monies as appropriated for quick and efficient relief caused by the volcanic eruption. “I am in contact with Mayor Harry Kim and Hawai‘i County, and the state is actively supporting the county’s emergency response efforts. I have also activated the Hawai‘i National Guard to support county emergency response teams with evacuations and security,” said Gov. Ige.